Stirling became a city in 2002 during the Golden Jubilee of Queen Elizabeth II. Historically, Stirling is an important site due to it's strategical position offering a crossing point over the River Forth. There is evidence of a fortress settlement dating back as far as prehistoric times. Stirling marks the crossing point between the lowlands and the highlands of Scotland and because of this it is often referred to as the 'gateway to the highlands'. This strategic position meant that whoever controlled Stirling and Stirling Castle also controlled Scotland. This led to many important historic events occurring in the Stirling area including the battle of Stirling Bridge in 1297 where William Wallace defeated Edward I of England and the Battle of Bannockburn in 1314 where Robert the Bruce defeated Edward II's English army to finally win independence for Scotland. Both battles and Scottish heroes are commemorated. The Wallace Monument towers on top of the crag and tail hill next to the castle and there is a statue of Robert the Bruce on the esplanade of Stirling Castle. There is a new Battle of Bannockburn experience and visitor centre near the site of the Battle of Bannockburn. Some of the best places to stay and visit include the towns and villages of Callander, Aberfoyle, Port of Menteith, Doune, Dunblane, Kippen and Bridge of Allan. 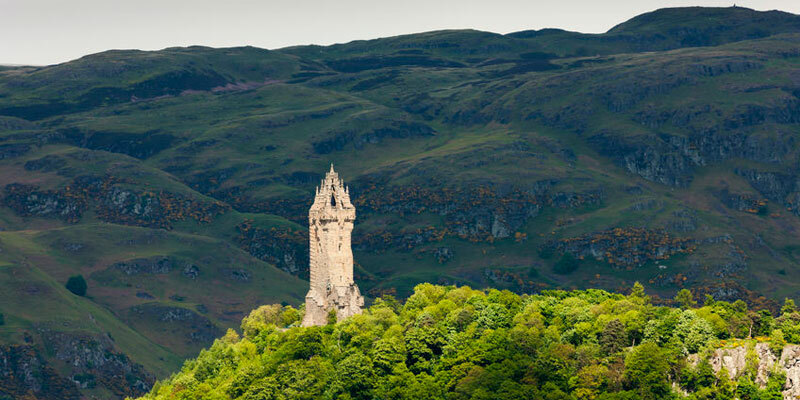 There are many great things to do and see in the Stirling area. In addition to Stirling Castle and the Wallace Monument, other historical sites in the area include Doune Castle and Inchmahome Priory. Children will enjoy the Blair Drummond Safari Park. Complete your visit with a sail onboard the steamship at Loch Katrine within Loch Lomond and the Trossachs National Park. Sirling was the filming location for scenes in the Outlander TV series. For accommodation near Outlander filming locations, please check out our dedicated Outlander Locations page.